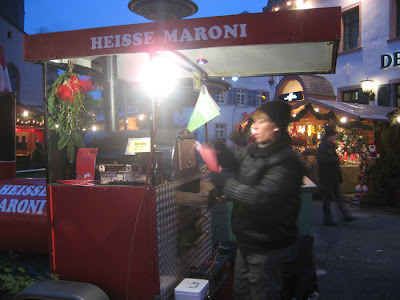 Sarah Cooks: Germany 2007: Christmas Markets! Weihnachtsmärkte. 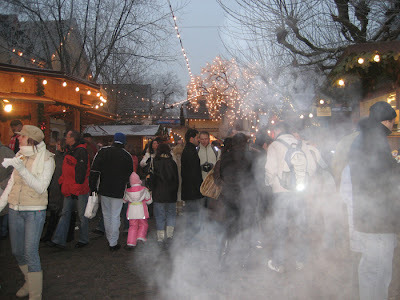 German Christmas markets. I have to tell you, I have been dreaming about Germany's famous Christmas markets ever since I bought my ticket here, back when the weather at home was just warming up, and the truckloads of Christmas stollen and marzipan began arriving at my work. Before this year, I'd never done a traditional Northern hemisphere Christmas. 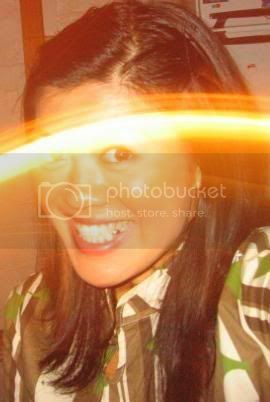 For much of my young adult life, we were in Penang each Christmas, sunbathing and drinking happy hour cocktails. More recently, Australian Christmas meant braving the hot weather (or unseasonable rain and cold, as the case may be) and going ahead with a turkey and all the trimmings. Needless to say, I was very excited about the prospect of a proper, white Christmas. Weinachtsmarkts appear all over Germany in the days before Christmas, usually located around a church. They feature stalls selling Christmas culinary specialities, hot drinks, arts and crafts and so on. (By 'arts and crafts', I mean that usual crap people flog at markets, but Christmas-themed!) 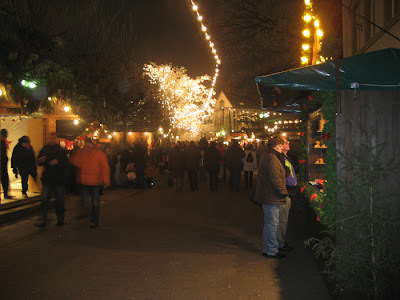 It is an essential part of a German Christmas to visit at least one Christmas market over the holiday period. As the sky gets darker, the lights get brighter, and the whole market looks gorgeously festive and beautiful. My host mother very kindly took us to the Deidesheimer Weihnachtsmarkt, a largish Christmas market in nearby Deidesheim (duh). It's colder than my smile may suggest. 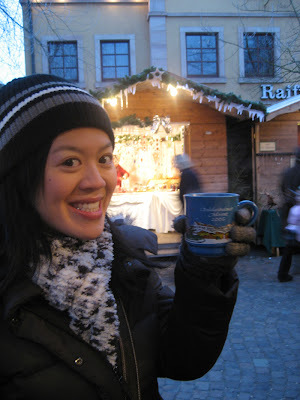 That great German winter staple, Glühwein (mulled wine). I have made it myself once before, but as with many things, they taste so much better in context. 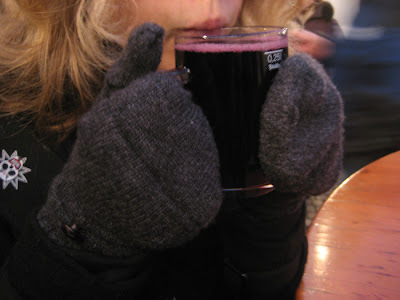 There is just something magical about walking around in the crisp night air, until you are so cold that all you can think of is some hot, sweet, strong Glühwein to warm you up from the inside. You can get Kinderglühwein (non-alcoholic mulled wine), made of warm, spiced grape juice, for the kiddies or teetotalers, which tastes much better than it sounds. I haven't come across many teetotalers in Germany, but I guess it's good to know your options. I suppose the literal translation of this is "fire cake", but this "cake" is closer to a thin crust pizza. 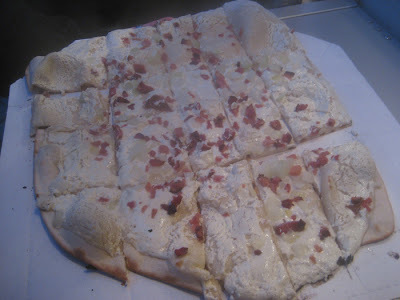 As you order it, they stretch the dough out over a wooden paddle, slather it with crème fraîche, onions and ham. 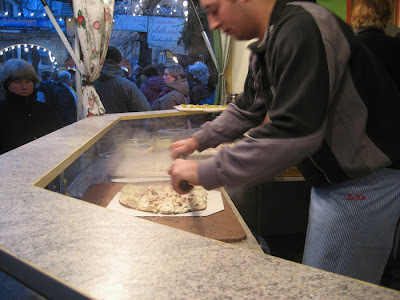 Then it is baked in a wood fired oven, and chopped into pieces before your eyes. Sometimes, burning the roof of your mouth can be really rewarding. There were also stalls selling what we Aussies might consider staple German market food - hot sausages in rolls, doughy salty Bretzel etc. What interested me more, however, were the cold rolls. 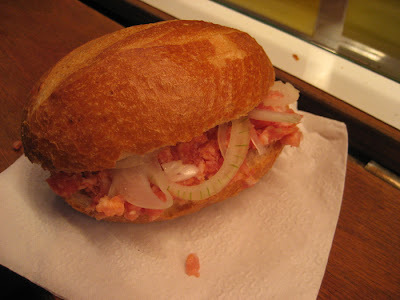 Some were filled with herrings or other fish, but they also had some called Bratwurstfilzl: raw bratwurst meat, stuffed into a super-crusty roll with slivers of onion. I only had a tiny bite of my host mother's Bratwurstfilzl; I was curious, but not game to try a whole one. Oh man, it was GOOD. Better than a regular cooked sausage! I would have bought my own if I weren't getting full by this stage. Luckily, I have been assured that this raw sausage thing is a normal, everyday thing that can be bought at the local butcher and eaten for lunch at home. Does anyone know where I can get this in Melbourne? I'm not sure if Melbourne's butchers sell Bratwurst fresh enough to be eaten raw, but if anyone knows of one, please let me know! Now we come to the sweets. Some sweets that feature prominently include candied nuts, chocolate-dipped fruits (visit here if you're craving quality chocolate-dipped fruits in Melbourne), sugary sweet Schneebälle (snowballs), Lebkuchen, waffles and crêpes. I've noticed that people here tend to fall into the 'waffle' camp, or the 'crêpe' camp, and quite strongly too. For now, I am quite happy to sit on the fence and eat both waffle and crêpes to my tummy's content. Mmm... waffles cooked on a pan taste so much better than domestic electric ones! You just need that intense heat to get the crispy edge. 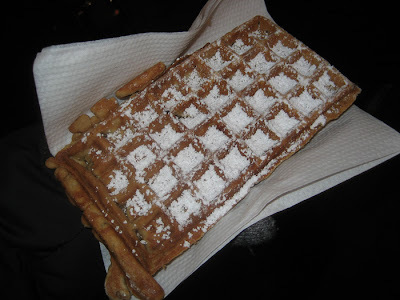 These waffles had a hint of Zimt (cinnamon) through the batter, and, covered in Puderzucker (powdered sugar), were very delicious indeed. 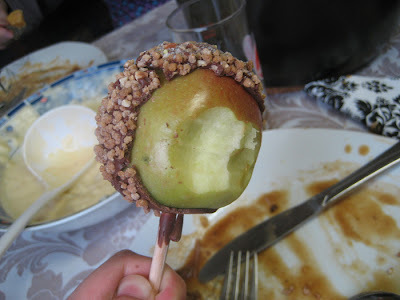 Schokoladenapfel. (Chocolate apple). I couldn't resist buying one to have at home later. 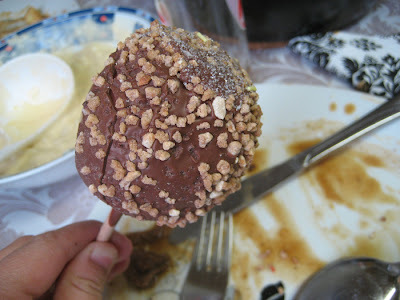 My Schokoladenapfel was covered in chocolate, sugar and some sort of crispy sweet thing. Sad to say, this is possibly the healthiest thing I've eaten during my whole time in Germany. Are your trousers getting tight? I know the feeling! Everything looks fantastic, and I'm well impressed mit your burgeoning Deutsch vocabulary!! Lisa, the answer is sweatpants. Sweet, sweet sweatpants. I've spent the last 7 christmas's in Southern Ontario and this year, we went back to Florida( where I grew up) and it was really weird for my partner. She wasnt used to seeing palm tree's and now snow at xmas time.